Way too easy. Come on, at least make us work for it. Its’s clearly New York City, NY, USA. I don’t care where it is, but I could live there! If every human being could spend two weeks annually at such a place, workplace violence and domestic abuse would disappear. Vaduz, Liechtenstein. Because of reasons. This is a straight-up stumper. No (readable) signs, no cars, no people. no livestock. Six buildings partially visible, and a paved road running through, in some very lovely mountains. Let’s start with the mountains: those could be the Rockies (or other range in western North America), the Alps, the Andes, or somewhere odd like Japan or New Zealand. The sun looks to be more or less directly overhead, so let’s eliminate the southern hemisphere. My first impulse was Switzerland, but the houses don’t look typically Swiss. My next impulse was Scotland. That feels closer. If anyone is going to actually decode this (i.e., if anyone is going to get it without having been here on vacation and recognizing it) my guess is that they are going to figure out what is up with that yellow box on the side of the building in the foreground that looks like a hand soap dispenser. I am not going to be that person. I’m really looking forward to finding out how the winner deduced this, because I haven’t a clue. We have that funny yellow box on the side of the foreground building, but after much googling I still have no idea what it is. Perhaps the style of the sign on the road evokes something for someone, but not for me. Perhaps the combination of the old stone construction, the slate roofs, the solid shutters, and the mountainous setting all add together in a unique way for someone out there, but not for me. Or perhaps the trees make it clear. The best I can get is somewhere in Europe. I think those who wanted a difficult contest got there wish. Just because I want to make a guess, I’m saying Rottenturm, Switzerland because it looks like it could be somewhere in Europe and that’s where my grandmother was born and lived until she was eighteen and fled Europe for the United States. The look of the buildings and the slopes behind them are how I imagine that town must look. That is almost certainly where I do my secret banking in Switzerland. I’m not allowed to be more specific. La Mare-aux-Geais, France. 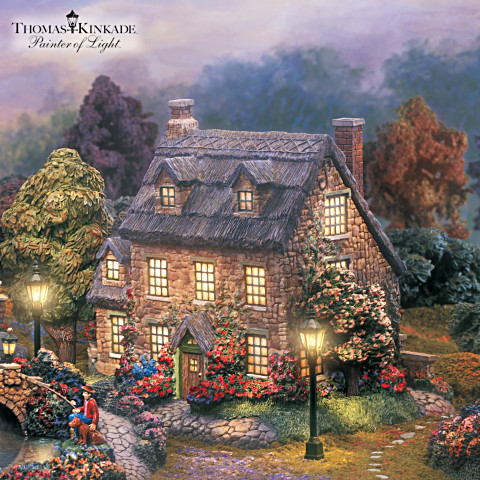 Looks like a hameau. Now where did I recently read the word hameau? Oh yes, in the Dish post about La Mort Aux Juifs. The description of the hameau in that post is two houses and one farm. So that is my guess. The landscape combined with the slate roof, stone buildings, and dormer windows is a good fit for the Pyrenees. But this is a really tough one to narrow down further. There are a million little towns and villages in the French and Spanish Pyrenees, and there’s not really a good way to explore them all. I’ve officially given up and will randomly pick the French town of Fos. I’m anxious to see how the winner(s) this week will identify the exact spot. Grit, determination, and many hours of browsing google earth? ESP? What will the secret be? I know this is probably somewhere in southern Germany/the Alps but those slate-shingled roofs, the mountains, and the green foliage remind me of the tiny sub-region of “O Bierzo,” the far western corner of the province of León in Spain, just east of the region of Galicia (in fact, they speak the Galician language there, too). Slate-shingled roofs are very common in O Bierzo as well as in neighboring Lugo province, but clay shingles are the norm nearly everywhere else in the country. This one was fun. At first the general alpine-ness suggested the Alps, but poking around there didn’t turn up the right mix of architectural features. Cycling fans know that if it’s not the Alps then it’s the Pyrenees, so off to the Franco-Spanish border. The ridgeline matched one outside Vielha, Spain, just a stone’s throw from the French border and familiar to obsessive cycling fans who remember it as the teams’ home base before last Tour de France stage 16. This was the most difficult contest in quite a while. 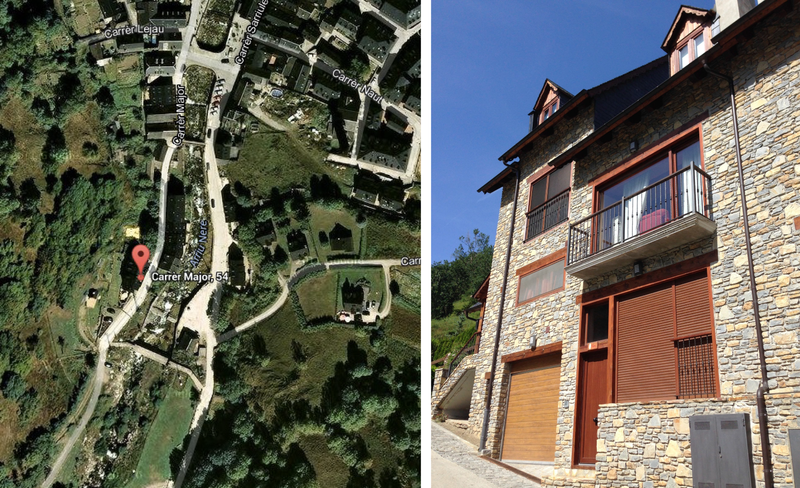 This week we are in the Spanish Pyrenees in the town of Vielha. For the building appears to be named Nere and the closest address on I could find is 54 Carrèr Major, 25530 Vielha, Lleida, Spain. On the second floor of the building, there are two large windows that open onto small balconies. I believe the contest window is the one on the left when facing the building (i.e. the one further south). The window is in the box in the attached picture. 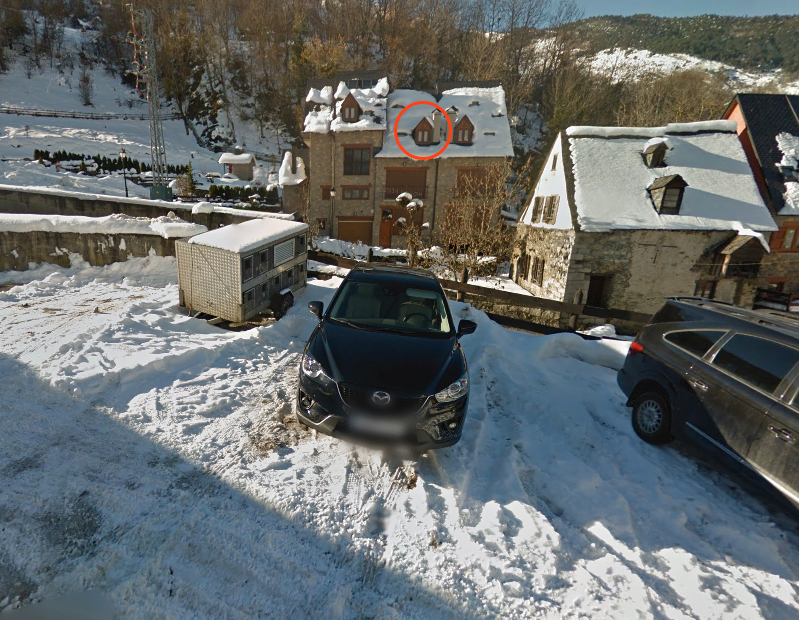 I also attach one street view picture showing a snowy version of the same scene, but just from one floor down. And for good measure attached is a third picture taken from the parallel street across the Arriu Nere showing the building with the contest window and two of the buildings in the contest picture. Now that’s what I’m talkin’ about. After a tough few days I needed a good view to hunt and this one made up beautifully for Dish Editor Chris Bodenner’s maddening eephus pitch from last week. The lack of landmarks means that we’ve got a classic “hard” view on our hands, but its proximity to Spain’s biggest ski resort makes me think that there’ll still be a decent number of responses. Eight correct answers, perhaps? This week’s view comes from Vielha, Spain in the Val D’Aran just a few miles south of the French border. The picture was taken from a sliding living room door on the second physical floor of the Casa Mijaran rental apartments (most likely Mijaran #1) located at 54-52 Carrer Major and looks east-north-east along a heading of 71.37 degrees over the banks of the River Nere, a tributary of the Garonne River. I’ve also attached a picture from the interior showing the likely spot where your viewer was standing. A really difficult one this week! 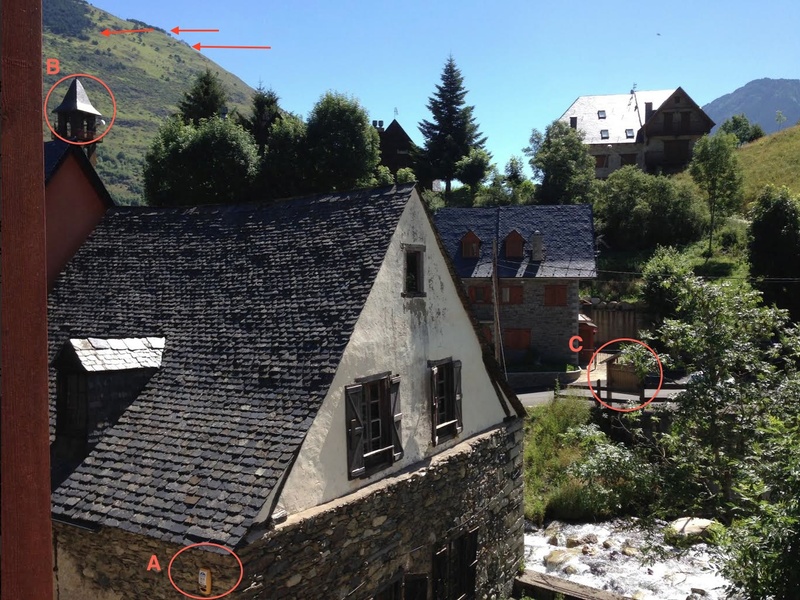 I am pretty certain it is on the Pyrenees, given the terrain and the architecture, but finding the exact mountain village with the scant clues present in the picture is beyond me. Just for fun I am going to guess Arties, Spain, though I’d be flabbergasted if I turn out to be right. It’s from an apartment in Vielha, Spain, where we spent a week in July. Vielha is in the Pyrenees in Catalonia and near the French border. The photo will be tough, I think, but there are mountains and a bell tower in the center of town which are both visible in the shot. There’s also a creek/small river in one of them. That could help too. We’ll do an easier view for next week. If you’d like to try and find out where, we’ll see you on Saturday.